Before setting out on this review, I must apologize for the liberal use of the first-person pronoun, which I normally use sparingly. This book intersects my personal and professional interests at several points, so I’m not even going to attempt an objective, impartial review, if such a thing is even possible. I am, as Lewis was, a student of medieval literature, though I can only dream of reaching his depth of knowledge and scope of imagination in this field. Furthermore, I undertook part of my studies at Oxford University, which was home to Lewis for much of his life. The City of Dreaming Spires, as Matthew Arnold called it, exerted a profound influence on Lewis’s life and work, and having walked its winding cobbled streets and ancient quadrangles it’s easy to understand why. Last, but certainly not least, Lewis’s Chronicles of Narnia had a profound impact on my intellectual and imaginative development as a child. In this I suspect I’m not alone, and I hope this review will encourage readers to learn more about the life and mind behind one of the wellsprings of modern fantasy. Before discussing the biography itself, I should say something of its author. Though currently Professor of Theology at King’s College, London, McGrath’s previous post was in Oxford, where I had heard his name spoken with a great deal of respect while I was there. The biography lists ever so slightly in the direction of Christianity, reflecting its author’s background in theology and apologetics, but on the whole it’s a balanced work firmly grounded in scholarly research of Lewis’s works and correspondence. The biography, of course, deals extensively with Lewis’s religious and spiritual development so central in his life and work, but the work by no means white-washes Lewis’s life or even his faith. 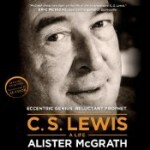 This audio recording is preceded by an interview with McGrath, whose calm, measured voice assures us as listeners that we’re chosen a trustworthy guide down the path of Lewis’s life. Like most biographers, McGrath takes a strictly chronological approach, with very few detours either to backtrack or to foreshadow. The narrative takes us through Lewis’s birth and childhood in Northern Ireland, through his lengthy tenure at Osxford University, to his final years as Professor of Medieval and Renaissance English at Cambridge. The biography strikes a delicate balance between Lewis’s rich inner life as reflected in his writings and his sometimes tumultuous outer. In the former case, McGrath devotes considerable space to Lewis’s conversion experience and subsequent development of his spirituality. As an academic, I was also pleased that Lewis’s scholarly works, notably on Edmund Spender’s Faerie Queene and Milton’s Paradise Lost, receive some attention. In regards to Lewis’s personal life, the biography charts Lewis’s many professional disappointments resulting from his popular religious work and the rift that formed between Lewis and other Oxford academics. Lewis’s relationships also receive some attention, in particular his long-running peculiar arrangement with the older Mrs. Moore and his controversial marriage to Joy Davidman. Of course, there is significant interplay between Lewis’s inner and outer lives, and McGrath expertly weaves these strands together to illustrate how one sometimes influenced the other. The book concludes by reflecting on the rise of Lewis’s reputation in various circles, religious and popular, after his death in 1963. Two whole chapters are dedicated to Lewis’s development of The Chronicles of Narnia. McGrath packs a lot of material into these relatively few pages, from Narnia’s inception in Lewis’s mind, to the debate over the proper reading order of the books (Lewis’s ordering, order of publication, or internal chronology), to the works’ modern reception, especially Philip Pullman’s criticism. This section also manages to delve a little deeper, too, highlighting the philosophical and theological underpinnings of this imaginative, not imaginary, world. McGrath deals with the question of whether Narnia is an allegory, and also links the work to Plato’s Republic and the allegory of shadows in the cave. Obviously this is a lot of topics to cram into so little space, and I would have liked a more thorough treatment, but to be fair this is a biography, not a work of literary criticism. McGrath has promised a fuller, more scholarly edition of this book in the near future, which will likely feature copious footnotes providing a wonderful paper trail for the Narnia enthusiast eager to learn more. SFFaudio readers should also note that Lewis’s lesser-known Space Trilogy also receives brief treatment in this biography. Though built on academic bedrock, C.S. Lewis: A Life is written in a lively, accessible style. McGrath uses Lewis’s own words, or the words of his associates, when possible, which imbues the book with a sense of immediacy and authenticity to the work. I sometimes felt as though I were in the room with Lewis, Tolkien, and the other Inklings as they discussed important religious, mythological, and literary matters. Like Lewis himself, McGrath also has a way of explaining complex intellectual and theological matters in a way that an average reader like me can understand. This is, in my view, the hallmark of any solid intellectual or literary biography. My only criticism of the book, and it’s a trifling one, is that McGrath hardly even alludes to any sexual relations between Lewis and Mrs. Moore, or later between Lewis and Joy Davidman, even though it’s obvious there was some sort of sexual element to these relationships. Perhaps McGrath found this matter distasteful, or thought the book’s Christian readers would. In any case, this omission is to me the one glaring lacuna in an otherwise thorough life story. 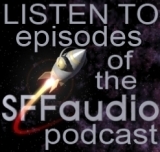 Robin Sachs’s stately narration lends the perfect air of British respectability to the audio edition. His pronunciation of some of the book’s more arcane linguistic and literary terms are, for the most part, spot on. As mentioned earlier, the inclusion of an interview with Alister McGrath, is a welcome addition, and provides additional insights into an already insightful work. Another minor quibble: I feel the interview should have been included at the end of the audiobook, rather than the beginning. I prefer to go into a book unbiased by the author’s later thoughts on the book. Again, though, this quibble is very minor. What does conclude the audiobook, however, is an amazing recording of Lewis at his deep-timbres lecturing finest. There are certainly many other windows into the lives of C.S. Lewis, J.R.R. Tolkien, and the other Inklings. Despite the influence of these authors on my own life, I have to admit I have not read most of these other works. So I’m very glad that one of the first I’ve read has proved to be such an enlightening and entertaining journey, (mostly) free from the partisanship and polarity that plague some biographies of relatively recent figures. I can’t think of many readers who wouldn’t benefit from or at least be entertained by Alister McGrath’s C.S. Lewis: A Life. I was actually happy that McGrath skipped the sexual guessing that often is found around C.S. Lewis’s relationships. Mostly because I was only interested in the literary stuff and not really interested in McGrath’s guesses about any part of Lewis’s life. My review is here.